Around two decades ago, life found me hanging out with friends at their house. It was the usual sort of hang out in those days which meant talking rubbish, partaking of the occasional ale, making up rubbish plans to take on the world, but mostly it just involved us talking pure rubbish. The memorable thing about that particular visit was that my friend’s father was visiting from New Zealand and had decided to stay in Melbourne for a few days. My friend was the youngest of about eight siblings, so the father was of quite advanced years and I’d never met him before. Clearly, the father was a man of few words, because once the introductions were made, he shook my hand and said, “Very Nice!” – and that was that, because we did not enter into further verbal discourse! So, I’ve been left with this long unsolved mystery. What exactly did he mean by that phrase? I’m not usually lost for words, and in fact it can be very hard to shut me up sometimes, but on that particular occasion, I was completely stonkered for a reply, so I simply shook his hand and must have looked like a deer in the headlights… It didn’t actually help that my friend for many years afterwards, usually with a highly amused grin on his face, used to rib me by repeating that exact greeting phrase. And back in those days, it wasn’t as if you could jump on the internet and type in a search request for the actual social meaning of that phrase as a greeting. Agony aunts were plentiful and actually useful in those days in such a situation, but it was a bit touch-and-go as to whether they would actually reply to your question as they were a law unto themselves and wielded their powers for both general amusement and self interest. Spring has sprung here. That is “Very Nice!”. This week the weather has warmed and the sun has shone strongly. On the other hand, some of the nights have been actually colder than the recent Antarctic anomaly, so please spare a thought for poor Poopy the Pomeranian who stoically endured a haircut last week and then had to spend those cold frosty nights quietly asleep in front of the wood heater (instead of his usual outdoor sleeping arrangements)! Unfortunately for me, Poopy enjoys waking up at the crack of dawn and so he has been a bit of a nuisance. However, the days have been warmer, the sun is a little bit higher in the sky and you can now feel its bite. A lot of the fruit trees are still only just producing buds, whilst many others are producing blossoms. The Echium plants have gone from strength to strength. The bees think that the Echium flowers are “Very Nice!” too, because they are all over them during the day, doing their bee like thing. The activity in the bee hive is starting to pick up pace and I’m wondering whether I should add an extra box to the current hive. An observation port would be a very useful thing in that existing bee hive. 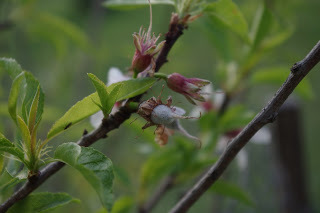 What was very nice to see this week was that one of the very early fruit trees (the almonds) had actually passed from the blossom stage (that is the fancy name for a flower on a fruit tree) to actual fruit. In the photo below you can see all of the various stages of an almond tree. In the fuzzy and out of focus background there is a blossom basking in the sun. In the foreground of the photo there are two blossoms where the flower petals have fallen off. It is important to note that at this stage, those blossoms, may or may not have been pollinated. The piece de resistance however, is the little green fuzzy almond fruit swelling on the tree, where once a blossom showed off it wares to the pollinators. Alright, I have to fess up. 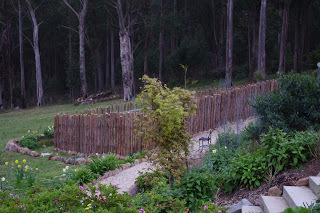 The whole “Very Nice!” theme of this week’s blog came about because I’d finished installing the last of the sapling pickets on the new berry bed enclosure this week – get it: “very = berry”. Yeah, it is a bit lame, but I was enjoying myself anyway, so whatever! 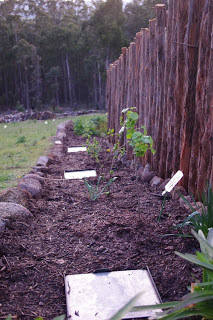 By the time that construction of the new berry bed enclosure had been completed this week, I’d installed around 320 picket saplings around the entire outside of the enclosure. 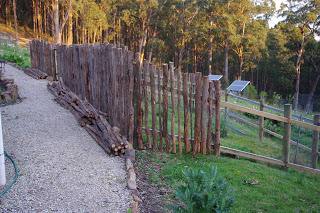 When I’m inside the enclosure I feel as if I could single handedly hold off an invasion of Vikings and that isn’t a bad thing because the wallabies and wombats here are just about as ruthless and cunning as a longship load of Viking warriors when it comes to sampling the various berries plus their leaves and canes. 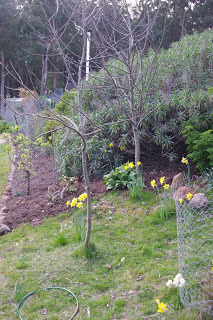 The wombats and wallabies have really enjoyed eating all of the berry canes that I have ever planted over the years. Interestingly, the berries always regrow from such unrelenting punishment and over the next few weeks I’ll move many of them into the new enclosure. 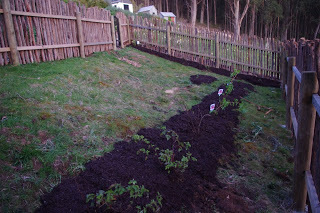 However, I was so relieved to have installed the final sapling picket that I went a bit silly and went out to the local nurseries and purchased many new berry plants to plant into that new enclosure. Regular and observant readers will also note in the photo below the very rare white with brown head berry variety: Rubus Scritchii. 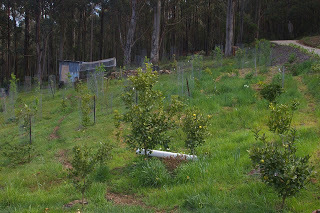 Once the berry enclosure was completed, I was then able to plant it out with all of the purchased berries plus some of the berries that I relocated from elsewhere on the farm. 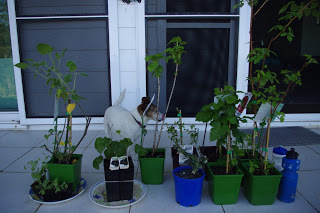 On one outside edge of that berry enclosure near the worm farm outlets, I have planted a further dozen or so berry plants and cuttings such as: currants; gooseberries and jostaberries. So far, the wallabies and wombats have shown no interest in such plants, but you never know what the future holds. 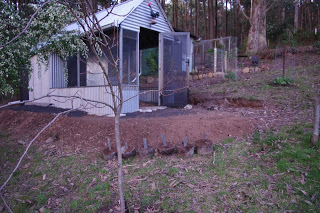 The berry enclosure took far longer to construct than I’d originally intended. There is so much free space left over inside that enclosure that I’m now considering planting the many tomato seedling plants that have since germinated over the past few days. 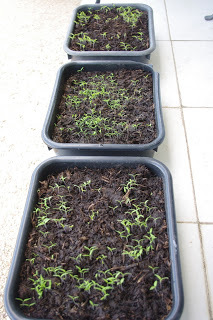 The cherry tomato seedlings in the above photo represent the results of about four year’s seed selection. In that mix there are yellow, red and red/black cherry tomatoes. The interesting thing about those seedlings is that they were raised in mushroom compost as distinct from the more usual very sandy seed raising soil mixtures. Mushroom compost is not an ideal seed raising mixture, but it is what I have on hand for that task and I take a very tough love attitude with seedlings. The seeds germinated in under a week and have been growing strongly ever since. I understand that the trick with seedlings is to transplant them once they have grown their first adult leaves. It is worthwhile noting that when there are only one or two leaves on a seedling, those leaves are often referred to as juvenile leaves and at that stage, it would be unwise to transplant the seedlings. There was a minor correction to a dog’s breakfast of a problem here this week. With the recent new chicken enclosure, I had constructed six concrete round stepping stones which allowed me to walk across the deep litter mulch which the chickens spend most of the day scratching around in. Anyway, these beautifully crafted, bespoke round stepping stones were a good idea, but a complete waste of time. This is because the chickens simply buried them every single day in their deep litter mulch. I couldn’t even find them most of the time, until the rake which I use to turn over the deep litter mulch, clunked into them. Over the past few days I simply removed them from the chicken enclosure which only took a few minutes. The concrete will not go to waste either as I will break it up using the – now fixed – solar powered electric jackhammer and incorporate the rubble into new concrete steps in the future. Fixing the electric jack hammer was an interesting project too, because the plastic handle that broke on the tool, put it completely out of action. So, I contacted the manufacturer who supplied me – for a price – with two replacement handles. It took about a month for the parts to arrive, but after about 20 minutes of installation, the tool was ready to use again. I requested two handles on the basis that if one broke, then another handle will almost certainly break down the track. I did promise to write about the continuing history of the house construction this week, but that was a total lie because this week I’d rather write about: Dog food! I do realise that I’ve lost credibility, but I promise we’ll get back to the house construction story next week. Observant readers may have noticed that there are a few dogs here at the farm. They take a lot of feeding. So, over the past couple of months I’ve been experimenting with replacing commercially purchased dog food with home cooked dog food. The results are now in and I’ll share them with the readers here. Scritchy the boss dog is an old girl. Time waits for no canine and there is no getting around that fact. A couple of months ago, I noticed that Scritchy had been turning up her nose and rejecting her usual breakfast feed and had begun getting thinner. Her mate Toothy was also likewise turning his nose up at the breakfast feed. Yet, they both were clearly hungry and eating other things. My maxim: If it seems odd, it is probably because it is odd, came into play. I started wondering what is in this stuff that I’m feeding the dogs. The product labels did not explicitly disclose what exactly was in the feed, which left me totally in the dark about the product. Then I started thinking, I’m spending several thousand dollars a year on this stuff and I’m not even sure exactly what it is and the dogs don’t seem to like it as much as they like wombat manure. Anyway, I modified my own muesli and biscuit recipes for the purposes of producing the dogs breakfast muesli and night-time biscuits. Here are the recipes. 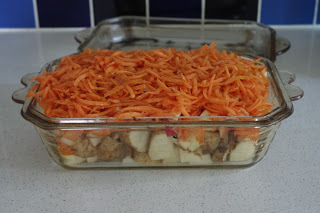 Take any old vegetables (with the exception of onions which I’m led to believe are toxic to dogs) and fruit then cut them up into small chunks and roast them until they are soft. I include whatever is in season but in the photo below are: apples; bananas; potatoes; carrots; pumpkin; and radish. I’ve also put in ginger, garlic, sweet potato, zucchini you name it – whatever is to hand. Once the stuff in the dish is properly roasted so that it is all soft then blitz the lot until it is a paste. Blitz is just a fancy word for turning the whole lot into a mash. And just because I like saying the word here it is again: Blitz! Then take three scoops of that mash. Add two cups of flour and then mix the lot until most of the moisture disappears and the whole lot becomes sort of crumbly. Add in two cups of oats. Add one cup of sunflower kernels. Add one cup of unsalted roasted peanuts. Add four eggs to the mix. It is a total shame that I cannot use the word blitz here, as you have to mix the lot together instead. Then using a small spoon, plate out the individual biscuits onto a tray so that you can chuck them in the oven. Before you place the tray in the oven it is not a bad idea to drizzle a small amount of olive oil onto the biscuits. In the oven they require a slow cook over about an hour to an hour and a half so they get really crunchy and brown – remember that black is burnt (edit – a famous Gordon Ramsayism “if its brown its cooked and if its blacked its fooked – whatever that means) – although the dogs will still eat them even if black. For a gas oven I set the temperature to 180’C (356’F). For the electric oven they are cooked at 150’C (302’F) and the wood oven they are cooked at 110’C (230’F). And here is a photo of me making dog biscuits and not getting tricked by business! These things are really tasty to eat too. 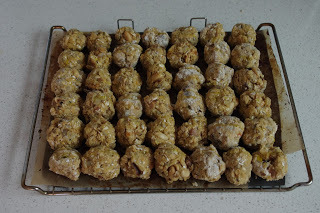 Muesli is the same mix but instead of making individual biscuits you add more oats, flour and sunflower kernels to the mix so that it is drier again. You can even chuck in some dessicated coconut to the mix too. The difference is that you drizzle honey instead of olive oil over the mix. 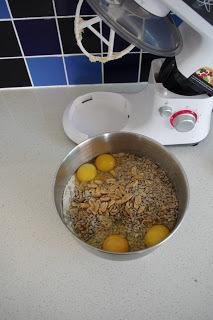 The other difference with baking the muesli is that you have to turn the mix over every half hour or so. 100% too easy, and much cheaper than buying commercial dog food. As an interesting side note, the local native birds now consume all of the dog manure here, which saves me the hassle of having to pick it up and put it into the worm farm. The other interesting thing is that the dogs themselves smell very neutral and their coats are also quite dry and clean feeling. The temperature outside here at about 9.30pm is 8.0’C degrees Celsius (46.4’F). So far this year there has been 600.2mm (23.6 inches) of rainfall which is up from last week’s total of 595.8mm (22.7 inches). It is not often I’m impressed with new products. Many new products are complete rubbish and very poorly made. I have a saying for that very circumstance: “That product is in for a good time, not a long time”. However, very occasionally even I can get suckered in by a bright new flashy product. Living in a remote spot surrounded by tall forest where even the neighbours are a distant memory, a person can easily forget about the world and all of its concerns. It is a sleepy way to pass the time and the biggest outrage can be when Stumpy the house wallaby has decided to destroy your favourite citrus tree. The seasons come and go and one day you look down into the orchard at dusk and discover that one of the two kangaroos that call this place home has grown up and now has a joey in her pouch and that joey is reaching out of the pouch to taste some juicy compost fed herbage. So to avoid falling asleep at the wheel, I regularly travel into the big smoke of Melbourne. Fortunately the country train services can get you there faster than a car and in considerably greater comfort – they’ve even got toilets on the trains! And from the Southern Cross Station with its wavy roof at the southern end of the city, I walk around and just look. Often those walks can take hours at a time. Over the past decade or so, the influx of University students to Melbourne (whom mostly derive from the Asian countries) have changed the city completely. Two and half decades ago the city at night was a complete dead zone where nothing moved other than the occasional rodent or wino. Sure, there were nightclubs, and they were dotted here and there, but away from those spots the city was dead. Nowadays, the city is full of life at night, people are everywhere, and there are even small hole in the wall restaurants that are frequented by their regular patrons. To me the exhaust from all of those restaurant kitchens reminds me of the alluring smell of an Asian city at night. It is a vibrant place to visit and I enjoy it. However, the long walks mostly take me through that city area and into the inner northern end of the inner city where all of the hipsters congregate. There are late night cafes where I can enjoy a well-earned coffee with an exotic and also very tasty cake. Quality food of many national origins is also there to be enjoyed. Sometimes it is a hard decision to know where to eat: Do I enjoy the Cajun food or maybe try some outstanding Chinese dumplings or maybe even something else altogether? The inner north of Melbourne is not only a place to find good food, but there is also the previously mentioned hipster congregation. If you’ve ever wanted to spot a Ned Kelly beard (so named by me after a notorious bushranger in the 19th century who ended his days hanging from the end of an official noose), well, the inner north of Melbourne will satisfy that curiosity. Personally, I don’t get the bushranger 5,000 overdrive thick beard look, but that may be a matter of personal taste – they just look like the beards are possibly unwashed and that is a bad thing! Unwashed beards aside, that inner part of Melbourne also has a lot of leading edge design shops displaying their various wares for sale. A lot of the products on display at those shops are locally made and chock full of creativity. I enjoy viewing those products on display through the windows because they are usually constructed lovingly with care and attention to both the detail and finish. I respect such work for the art that it is. 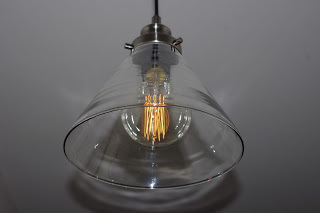 Over the past year or so, I’ve noticed that many of these leading edge design shops were illuminated by some very funky, old school, steam punk, filament light globes. Those funky light globes have always reminded me of the sort of light globe that you’d see in a Victorian era mad scientists workshop. I can just imagine the mad scientist (with the funky light globe in the background) working alchemistic miracles to bring Frankenstein back to life! It is worthwhile remembering that the house here is completely powered by solar photo-voltaics and batteries and as such energy hungry devices can generally apply for residency elsewhere as there is no tolerance for them here (edit – Hair straightener, hair dryer and Italian espresso machine are excluded!). So, on Friday evening I was on my way to get some Mexican food and stopped by the hardware store in the nearest big town to pick up a couple of new light globes. It’s an exciting life here at Fernglade Farm and Friday nights are no exception to that rule! Anyway, to my utter amazement, the hardware store stocked those funky steam punk light globes and so I thought to myself: I’ve gotta get me some of those! As I said, it’s an exciting life here at Fernglade Farm. I installed the steam punk globes in the hallway today and I can report that they use very little energy (about 25W a globe) and whilst they emit stuff all light, wow, do they look cool or what? 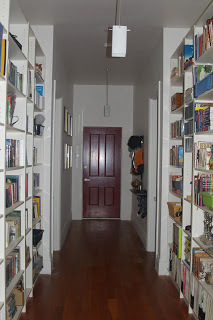 The hallway is a good spot for those globes because I don’t need much light in there anyway, and they remind me of the ambience of a late night bar or café which seems sort of appropriate for a library. 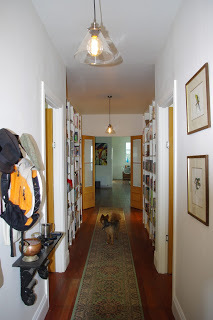 Even Poopy the Pomeranian – who is sporting a very recent haircut – approves of the new light globes! 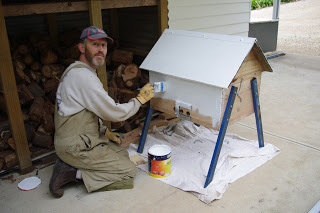 Back to more serious farm business and the new design bee hive received a coat of quality paint this week. I have also installed some removable plywood sliding covers for both the double glazed perspex observation port and also two of the three round entrance holes on the opposite side of the hive box from that observation port. The plywood cover over the two entrance holes will be in place when the bee colony is still young and they may not have enough guard bees to be able to defend all three separate holes. As the colony gets stronger and gains more numbers, I’ll then be able to remove that cover over the remaining two entrance holes. Over winter, that entrance cover will be in place to assist the bee colony using less of their stored food energy (honey) to stay warm. Over the past few days I created a further 99 pickets for the new berry enclosure. It will most certainly take about another full day to install all of those pickets onto the timber fence frame and even then, I’m still 21 pickets short of completing the job. Hopefully though, next week I’ll be able to start planting many of the various berries I have on hand into that enclosure. Observant readers will note that in the background of that photo above and slightly to the right of the solar panels, the almond trees are in full leaf and blossom and are clearly enjoying the (slightly) warmer spring conditions. Other fruit trees have only just begun breaking their dormancy this week. However, the evergreen Tagasaste trees (Tree Lucerne) are exactly like the native Acacias in that they are producing copious flowers this week. The leaves of this excellent tree make great chicken food as they contain very high levels of protein, so I have a few of that species next to the chicken enclosure. 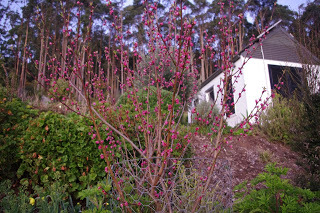 Last summer, I harvested the seeds from many types of tree species, but the frosts over winter have killed off quite a few of them, the Tagasaste trees seedlings on the other hand have shrugged off the frosts and have been growing strongly. 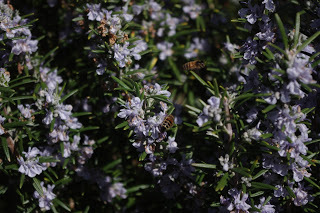 Speaking of flowers, the rosemary shrub in the herb bed has produced huge quantities of flowers over the past few weeks and the European honey bees adore that plant. Just behind and to the left of that rosemary plant there is a locally bred Anzac peach which is about to unfurl its pink blossoms. The fruit from that peach tree is a beautiful white fleshed sweet and juicy peach which is rarely offered for sale in the shops. 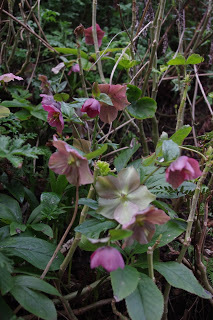 Hellebores have been flowering strongly over the past few weeks too. They’re great plants because they are very undemanding with the only exception that they require full shade, but once established in those conditions they’ll happily self-seed. Two years ago, I conducted an experiment by throwing some seeds of sweet peas (non-edible) into a garden bed to help boost the fertility of that particular garden bed. Plants of the leguminous family which include sweet peas can fix nitrogen into the soil – and generally also provide copious quantities of mulch when they die back. The sweet peas have since gone completely feral, and believe it or not in the photo below, under that mass of sweet pea there are actually a couple of very happy Chilean guavas. 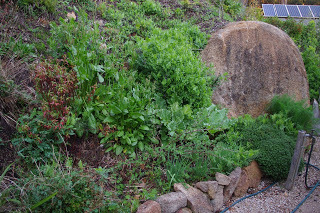 As well as those plants, in the photo below observant readers may be able to spot: gooseberry; rhubarb; fennel; lemon thyme; garlic; salad burnet; perpetual spinach; French sorrel and Vietnamese mint. Most of the garden beds have very diverse collections of plants but they all seem to play together well. I always encourage people to plant far more densely than they believe is possible. 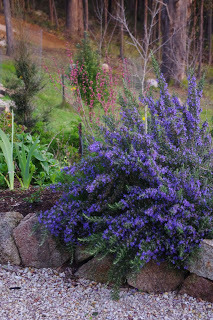 Dense plantings mean that the plants in those beds grow more slowly as they fight it out for minerals, light and water. 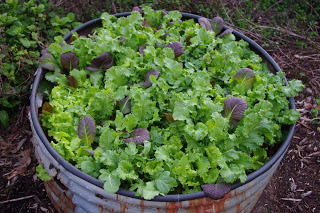 I want to be able to harvest edible plants over a long period of time, so if the plants grow more slowly, that makes for a much longer harvest period. When harvesting the leaves, I am absolutely ruthless about not allowing the plants to grow too quickly and bolt to seed, by simply harvesting all of the highest leaves regularly. However, I’ll allow some of those plants to grow large and produce seed which I will then collect for planting the following year. 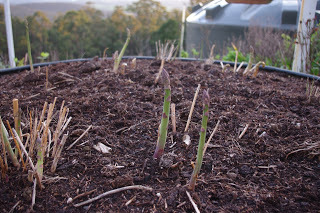 With a bit of spring warmth over the past week or so, the asparagus spears have just started to push their way out of the warming soil. Some of the crowns of those plants are now just over three years old and I can start to harvest the occasional spear to eat. I’ve been guilty of rabbiting on again this week and have completely run out of time – and reader’s patience – to talk about house building activities, so I promise we’ll return to that topic again next week. The temperature outside here at about 9.15pm is 4.7’C degrees Celsius (40.5’F). So far this year there has been 595.8mm (23.5 inches) of rainfall which is up from last week’s total of 575.6mm (22.7 inches). The Echium plants were a chance gift from a nearby neighbour. In the early days at the farm, those first Echiums were a very unimpressive set of specimens and to be honest they looked a bit sad. But I really appreciate gifts of plants, and so I planted the original gift plants in a well fed garden bed. And the plants just grew. And then they grew some more – and self seeded. I had no idea at the time just how big these plants can get. Those original Echium plants were like Triffids in that they just kept growing – it was a bit scary. 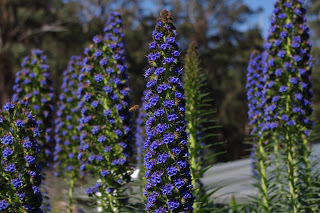 The Echium plants have shrugged off frosts, heat waves, drought, dogs, wallabies – you name it, but at the same time those plants also produce copious flowers for most of the year. I mentioned wallabies and Echium plants because occasionally, a wallaby will bounce into the middle of an Echium plant just to see what is in there. In the process of jumping into the middle of the plant, the wallaby will destroy branches and leave a gaping hole in the middle of the plant. Does an Echium plant worry about such damaging marsupial action? 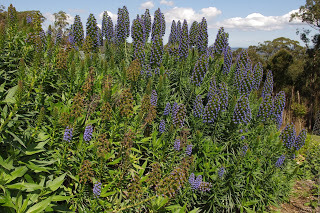 No, because a couple of months later, the Echium plant simply regrows all of the damaged branches, flowers and leaves. Where we we, ah yes, the sun was shining very strongly over the past few days and in fact on Sunday whilst I was working outside in the full sun on the new picket fence (see below), I unfortunately scored a minor case of sunburn on my skin – despite the fact that the UV is only rated as moderate (edit – serves you right, I told you to put on sunscreen). Fortunately, the strong sunlight has produced excellent hot water (very toasty too!) via the solar hot water panels as well as excellent electricity via the solar photovoltaic panels. Today, I had a great deal of trouble trying to work out what exactly to do with all of the excess electricity generated by the sun. 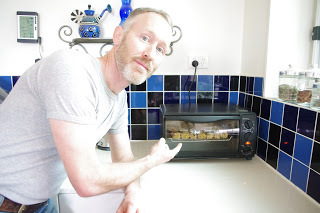 Fortunately, there is always the task of baking dog food in the electric oven, so I went a bit feral and produced well over 140 oven baked dog biscuits this afternoon. The dogs were excessively helpful with that cooking task too! As an interesting side story only Poopy the Pomeranian (who is technically a Swedish Lapphund) was clamouring for more food this evening, but he does have an unfortunate and unmentionable relationship with food. I could see it in his eyes that he was trying to tell me that: “food is not the problem, food is the solution!” In his particular case, portion control seems to me to be the solution, although Poopy and I have learned to agree to disagree on such matters. Anyway, the solar photovoltaics (PV) were producing a stupendous quantity of electricity at about lunchtime. Just for the techno geeks out there, I thought that it might be worth talking about PV solar panels for a little bit (everyone else who is not interested in such matters or doesn’t identify themselves as a techno geek can skip to the next paragraph or so – look for the welcome back everyone message in italics below!). We now prepare ourselves to enter the world of the techno geek: The dodgiest thing about solar PV is that a solar panel will only ever produce the rated output under absolutely perfect conditions. Perfect conditions means installing that panel at the equator, facing exactly north, at about the summer solstice and hopefully it’s not too hot. Therefore, in the real world, you can expect about 80% of the rated output of a solar panel. So a 190W panel will produce – in the real world – 152W which is 80% of the rated output. Will you occasionally get more output from that panel? – sure, but don’t expect that output much of the time! 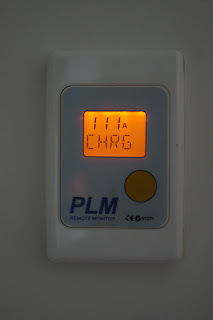 What that display means is that the 4.2kW of solar PV panels were producing 111A (A stands for Amps) at that point in time. With a bit of maths magic we can convert that reading to kW to understand what the reading actually means and the formula for that conversion is A x V = W (or Amps x Volts = Watts). So 111A x 29V (because that was the voltage of the batteries at the time of the reading) = 3.219kW. And, if we use some more maths magic we can divide that reading by 80% to equal 4.023kW (which is not far from the actual rated output of the 4.2kW of panels albeit at 80%). The formula for that calculation is 3.219kW / 0.80 = 4.023kW. Enough techno geek stuff as I can see that some of you are now falling asleep – I did warn you to skip this bit! With the strong sun over the past couple of days, many of the deciduous trees have broken their dormancy. 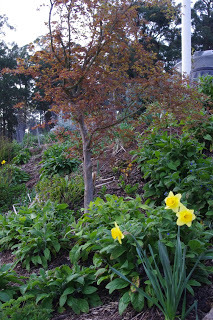 I spotted this advanced Japanese maple sending out the first of its leaves today in amongst a garden bed of borage (note the blue flowers) and daffodils. 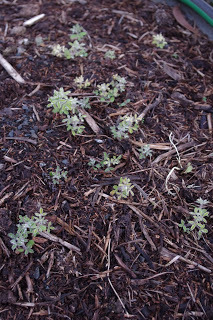 The borage is an excellent feed for the chickens all year around, great food for the bees and there are many dozens of these plants all about the farm. 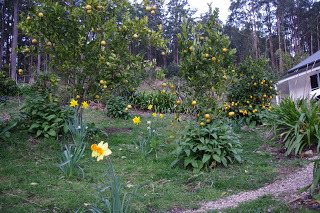 The citrus fruit trees have also been producing strongly over the past few weeks and in the photo below there are lemons, limes and grapefruit. I also have many other types of citrus fruit trees growing here, but a few years back over a very hot summer, the wallaby decided that it was hungry enough to eat the citrus fruit trees and they are now only slowly regaining their former glory. 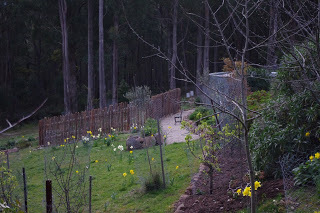 Observant readers will note that the Australian round lime in the centre right of the photo has suffered considerable damage over the past few weeks from the many house wallabies here at the farm. I’m very annoyed with the wallabies, but they have been unsympathetic to my complaints. Hopefully, sooner or later the fruit tree will outgrow the reach of those dastardly marsupials. The construction of the berry enclosure has continued apace this week and I have now installed over 200 pickets around the enclosure. There are still about 120 pickets to go before the area is entirely closed off from all of the curious herbivores here (take that wallabies). As well as the many berries that will be planted into that area over the next week or so, I’m also considering planting all of the tomato plants in there just for this season. 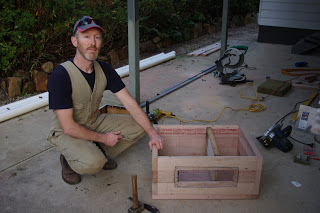 The construction on the Cherokee new wave TM bee hive continued this week and metal leg stands were added. Movable plywood boards were added so that the bee colony could be restricted to a smaller area in either its early days (only 5 frames are delivered with a purchased bee nucleus hive) or if the colony is having troubles and cannot support a larger area – this saves them energy in having to heat a larger area than necessary. The heat is required by the bees to raise brood. 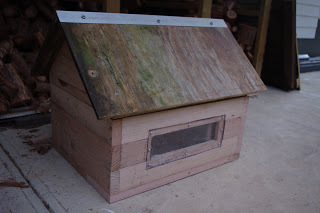 Also the editor suggested two aluminium angles at the top rear of the hive box which make for easier positioning of the roof (a good thing when you may be covered by angry bees and in a bit of a hurry to put the roof back onto the hive box!). Three round hive entry holes were drilled into the thick hardwood today and it is intended that two of them will be easily closed to reduce heat loss over the winter. I haven’t quite worked out the details relating to that entrance closing system yet. I also purchased some super nifty metal clips that secure the roof to the hive box and these were installed onto the hive today. 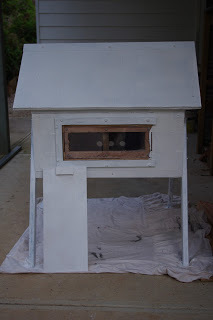 All that is left to be done now is to: wait for the roof plywood to fully dry over the next week or so; construct a plywood flap over the Perspex double glazed observation port; and then give the whole hive construction a good lick of quality paint. Spring is such a great time to walk around and observe the orchard and garden. And it is amazing what you can sometimes see on those walks. Many years ago, I planted these two Jonathon apple trees which were sourced from the same supplier on the same day. One of those two apple trees was planted into a well fed garden bed, whilst the other was planted not too far away in the orchard proper. The apple planted into the well fed garden bed now has a trunk that is almost twice as thick as that of the apple tree in the orchard. What I have learned from observing that difference is that well fed fruit trees will grow much faster than those that are not as well fed. 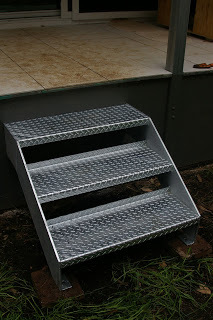 It’s been a few weeks since weeks since I wrote about house construction stuff, so this week’s blog will take us back to October 2011, where I installed two sets of galvanised steel steps. Because of the building regulations relating to bush fires, timber stairs were not an option as they are combustible. Steel stairs are normally seen in apartment blocks and commercial buildings and I had to obtain a quote from a commercial supplier. 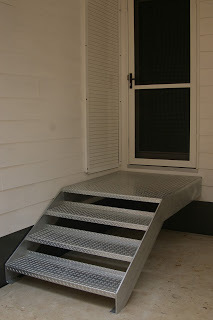 Fortunately, the supplier was quiet, so they whipped up the stairs in no time flat at a reasonable price. I unfortunately had no idea just how heavy these steel stairs would be, but as they craned the steel stairs onto the trusty old trailer, which made a resounding thud sound on impact, I was starting to get a bit nervous. Anyway, with a bit of farm engineering, I tipped the stairs off the back of the trailer and then proceeded to use a sledgehammer to slide them along the concrete towards their final position. The sledgehammer did not leave a single mark on the stairs! I literally could not move, budge or lift the bigger of the two sets of steel stairs any other way. To lift the stairs to the appropriate height, I simply put a bottle jack underneath it and slowly lifted the steel stairs into their final spot. Even the dogs had to get their own set of fortunately much smaller and lighter steel stairs. 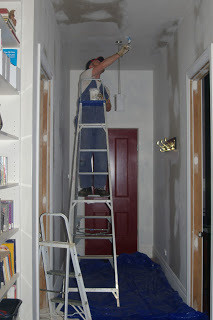 Much of that month was spent painting the inside surfaces of the house. And then one day the inside painting was done. The hallway painting was now complete. Hmmm, nice bookshelves! Way back then, the fruit trees in the orchard were very small. Observant readers will recognise the lemon, lime and grapefruit from the above photo in their much younger days. The temperature outside here at about 9.45pm is 15.2’C degrees Celsius (59.4’F). So far this year there has been 575.6mm (22.7 inches) of rainfall which is up from last week’s total of 569.4mm (22.4 inches). Apparently there is a big storm due to hit here much later tonight! All we are saying is: give bees a chance. I dabble with bees on the farm and have done so for a few years now. Australia is fortunately blessed with native bees and plenty of other insect pollinators. The thing is though, in the first year that I introduced European honey bees to the farm, the fruit set on the fruit trees doubled over that of the previous year. Fruit set, is the fancy name for whether the flowers on a plant or tree produce fruit or not after pollination – and it is the pollinating insects that do the hard work in that process and as far as European honey bees are concerned, they’re heavyweights in the pollinating insect world. European honey bees are quite prolific gatherers of plant pollen, plant nectar and water which they use to turn into the very desirable product: honey. The native bees aren’t even close to producing the sort of superabundance of honey that the European bee species can produce. In fact, this far south in a cool climate, the native bees will not produce any excess honey at all. I like eating honey, using it to cook with and also for making mead (which is an alcoholic honey and water based drink). Honey contains at least 80% sugar so it is an almost perfect source of sugar for cool climates such as the farm here. It would take an awful lot of global warming before I could easily grow sugar cane here (which is the plant source for sugar). The old timers used to grow sugar beets, which will happily grow here, but they’re only 20% sugar, whilst most other fruits have much lower sugar content again. Nothing at all beats honey for supplying sugar in cool to cold climates. However, the bees want to eat their honey, which is why they store it in the first place. It is their winter food store and they require that stored honey just to get the colony through the brutal winters that they evolved in. Winters in many parts of the world are far harsher than here and the European honey bees keep their hives warm by eating the stored honey. It has been the coldest winter here in 26 years however, if the daytime temperature goes above about 10’C (50’F) at any time of the year, the European honey bees will be out and about enjoying the warmth and collecting pollen and nectar. I grow flowers just for the bees (and the editor too!) and there are flowers of many different types all year around here so that even on the coldest days some brave plants are sporting flowers and the bees know all about them because when that sun shines, they will be busily going about their bee business and enjoying those flowers. Over the past few years, I have had at least five different European bee colonies here at the farm. Four of them have died. Three of them collapsed over a period of three days two years ago. During those three days the temperature exceeded 40’C (104’F) in the shade – every day – and the wax in the frames simply melted. The bees as a colony did not die, they abandoned their hives in haste and moved to cooler conditions in the shade of the forest. In effect, I have populated the surrounding forest with European honey bees – and just to tease me they visit the farm regularly to let me know just how well they are doing out in the forest somewhere. The other colony died because it was attacked by ants very early in the season when the colony had not recovered from the winter. As a disclaimer, I have not harvested any honey at all from any bee hive at the farm since I commenced the (expensive) hobby of bee keeping three years ago. And I’m not the only one who is having troubles with European honey bees. Last summer alone, I believe that about 40% of the colonies on this continent died over the summer due to the extreme weather conditions. It is worth noting that because of Australia’s relative isolation, many bee problems have never even arrived here (such as the Varroa mite which is devastating colonies on every other continent). European honey bees are fair dinkum hard little workers and all I reckon is that they deserve a chance! As a general rule I avoid bee community groups because even despite the massive quantity of bee colony die offs all over the planet, they are some of the most dogmatic people I have ever encountered. And that is saying something. As a general observation, it is a most impressive achievement to maintain dogmatic beliefs in the face of absolute disaster! I say instead: Give bees a chance! I appreciated failures at the farm (although not too frequently I hope – edit) because that is generally the time that I have to stand up and admit what went wrong and then learn from those errors. Most of the time I have to then repair the mistake and correct the underlying errors! So this week I began constructing a slightly different type of bee hive, which as far as I know is a completely original design. If anyone wishes to duplicate this design, feel free as long as you acknowledge me as the source of the design. The first thing that you’ll notice is that the bee hive is constructed from heavy duty hardwood. The reason for this is that I have observed that bees in the forest live in logs and tree hollows. The thicker timber in those natural bee habitats provides a greater level of insulation from the external temperatures during the winter and summer. My thinking behind using thicker hardwood is that honey is the bees natural winter food storage and if they are subjected to cold temperatures, they will consume far more stored honey as an energy source just to keep the colony warm. The standard commercial available frames here use very thin pine and it is just not up to the job of providing any insulation between the colony and the external environment. The thin pine is cheap though. I also added in an observation port which is constructed of double glazed 8mm (0.31 inch) perspex. 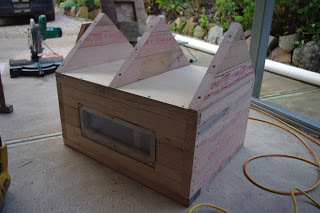 It will eventually have a hinged plywood flap covering that perspex so that the bees can enjoy their darker conditions – which they prefer (the insides of a log are usually dark). The new hive also takes the standard commercially available wax frames. The old timers have a saying: “Don’t throw the baby out with the bathwater”. That saying is relevant here because, whilst I acknowledge that there are issues relating to cell size in commercially produced wax sheets (and possible contamination too), it is better to start the colony with a bit of assistance in the early days. The design also allows for a fewer number of frames than the standard eight or ten frames. In the photo above you can see a single frame hanging in the hive box. When bees are purchased down under you are normally supplied with a package of bees in five frames (the fancy name for this is a nuc box). You may receive that package in early spring which is a cold time of year and the bees have very few stores to get properly established. 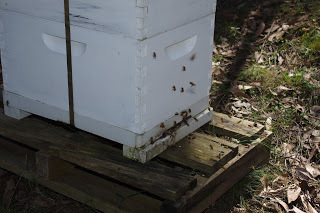 The standard commercial boxes include space for eight frames (whereas the nuc is five frames) but all of that extra space in the standard box means that the bees have to heat an even larger area just to stay warm. 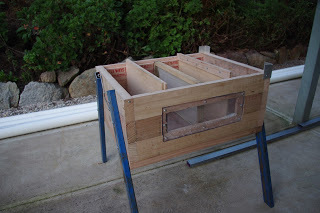 In my design there will be movable sheets of plywood at either end of the frames so that new frames can be added and the bees can fill whatever space they require. And with the observation port I can quickly see how the colony is going without having to open the box and losing whatever precious heat that they have stored in that hive. The roof to the new hive is designed to shed rainfall off and away from the holes that the bees use to enter and leave the colony. That seems common sense to me, but the standard hives have flat roofs and rain can simply fall onto the bees landing strip and run into the hive. And if the hive is not totally level rainfall will run downhill of the opening and into the hive itself. Honestly, how hard is it having a roof that sheds rainfall? 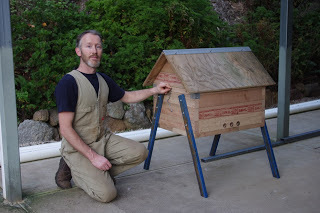 Flat roofs do make for cheaper hive boxes though. Observant readers will note that there is a layer of flat plywood which sits just underneath the triangle roof supports. The purpose of this plywood is ensure that condensation does not drip down onto the bee hive frames. Many people down under use cloth mats and other such items to perform this function, however, those mats sit on top of the frames which can potentially hold moisture against the frames. Readers with a good memory will recall that I like making mead which is an alcoholic drink which only has three items: Honey; Water; and Yeast. It really is that simple to make! Yeasts are literally all over the planet so whilst you can never be sure what sort of yeasts you’ll find in your area, if you throw a party for yeasts, some of them are guaranteed to turn up! The bees provide the honey. And whilst the bees enjoy access to fresh water to create their honey, too much water in a hive will definitely ferment the honey and produce mead – which whilst I’m quite happy with – the bees can’t actually consume without detrimental health problems. It looks like a dog kennel rather than a bee hive doesn’t it? And perhaps that is where the inspiration came from for the design. The roof plywood was rescued from an old door that had been removed from the old chicken run and had been out in the rain during this past month or two, so I’m leaving the hive construction for a week or so to dry off before it receives a good lick of quality paint. There is still a bit more work to do on the bee hive, but it is getting closer to completion and I’ll include photos over the next few months to show how it performs in the real world. It wasn’t all about bees this week though as I was collecting, cutting and burning rotten timber in the surrounding forest. This forest has been actively logged since the 1860’s so there is all manner of fallen and discarded timber lying around down below the farm and it is a serious fire hazard. 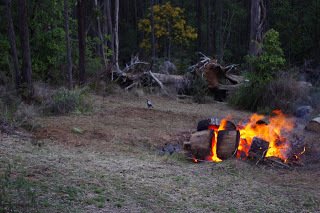 As I was working the forest, with the magpie bird clearly enjoying that work, I noticed just beyond the area of the fire two very large fallen trees lying on the ground. Clearly they’d been there for decades and when they fell over and they had even lifted the clay out of the ground leaving behind a pit. I thought that I’d take a closer look. 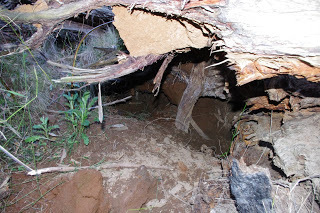 What I found was that there were two very large and well maintained wombat holes under the closest tree. 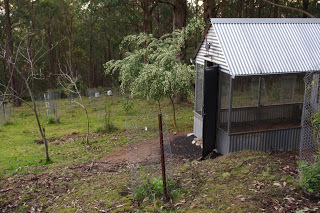 This perhaps is the abode of Fatso the very large and well fed wombat that cruises the orchard most nights (when it is not raining of course as no sensible wombat would ever venture forth for an adventure if it was raining). I’ve completely run out of time yet again this week to talk about house construction, so I promise we’ll get back to it again next week! The temperature outside here at about 9.15pm is 4.2’C degrees Celsius (39.6’F). So far this year there has been 569.4mm (22.4 inches) of rainfall which is up from last week’s total of 544.0mm (21.4 inches). Oh yeah, this past week was very wet!